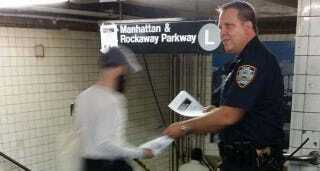 Following in the grand tradition of that woman who always asks you for money and that guy with the pamphlets about how the Apocalypse cometh, the NYPD is begging for new followers for its L-train-specific Twitter account the only way it knows how: By shoving fliers in the faces of passersby on their way to work. The often crowded L-train is notoriously unreliable, so it makes sense why the NYPD might want to dedicate an entire Twitter account to its various shenanigans and goings-on. The Department's analog-oriented follower recruitment method, though, could use a little work. Especially when you consider the fact that most subway stations don't even have cell service in the first place.